Whether it’s the vision of Jimmy Stewart, or simply memories of free lollipops and clock radios, banks used to be associated with positive feelings. However, shrinking margins have led to fewer locations, limited giveaways, and diminished customer service. Simultaneously, scandals have tarnished the industry’s image. On top of that, consumers are increasingly willing to put their investment accounts with one provider, their checking with a second, and their credit with a third. 22% of American consumers keep checking accounts at multiple institutions alone. This lack of consolidation in the consumer relationship inevitably erodes brand loyalty, and increases attrition. Resultantly, banks are playing an acquisitions game as they try to attract customers to a commoditized industry. The current state. 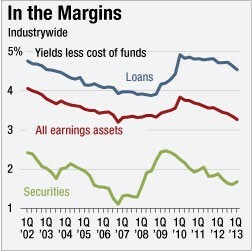 It’s not as if banks haven’t tried to change their trajectory. Banks have made enormous investments in infrastructure and, recently, digital technology. Frankly, they don’t quite get enough credit for the things they are delivering. Consumers have had a mixed response to these investments. The Federal Reserve reported that the usage of non-branch channels has increased dramatically, in many cases replacing transactions done at the branch. These features are also adopted by all age segments, not just younger customers. However, the deployment of these features has increased consumer expectations of banks while leaving loyalty unchanged. Since many of these products are available by third party vendors as white-labeled features, it’s easy for late-arriving FIs to add features that their customers care most about. This is further exacerbated by consumers’ inability/unwillingness to change institutions. Ultimately, this lack of responsiveness to new features reduces the incentive for large players to innovate because first-to-market has almost no value to customers. The Commodity Trap. Commodities are products that have high degrees of standardization, price transparency, and easily accessible alternatives. If that is the definition, is consumer banking a commodity? Undoubtedly, the answer is yes. 87% of C-level executives surveyed by Roland Berger believed not only that banking is a commodity, but that the tide started turning over 5 years ago. The product sets are largely homogenous, and additional features (smart ATMs, mobile banking services, mobile check deposit, etc.) can be stapled on by partnering with third party vendors. The advent of groups like the CFPB and Pew Charitable Trust has increased price transparency. Finally, alternatives remain somewhat elusive, if only because the inertia is so great. It gets worse. 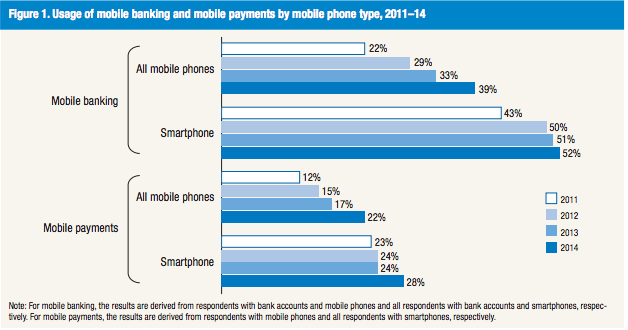 Banking is not only becoming a commodity, it is quickly heading into a commodity trap. Increasing pressure on margins from new players (e.g. the entire FinTech industry) is leading to a hopeless situation for the bigger institutions where price-based competition (interest rates, rewards, or acquisitions offers) are the only way to stand out. Nearly 75% of respondents interviewed by Roland Berger believed they are in a commodity trap while only 30% think their institutions are doing enough to escape competitor pressure. Bundling is an approach that banks have repeatedly tried. However, consumers are becoming increasingly comfortable with dividing their financial lives across multiple institutions so the strategy may have a low ceiling. Segmentation is equally difficult. Given the high operational costs banks face, creating many targeted products is impractical. In fact, many banks are eliminating products in order to reduce expenses and, ostensibly, provide better customer service. Innovation, while exciting, is risky and has a long lead time. It is unclear whether the release of a new app, relationship management tool, or referral tool will change consumer’s perception of a bank. More likely, these features will simply raise the bar for consumer expectations while leaving metrics like NPS unaffected. The future. While the situation is bleak, there are two mutually exclusive approaches banks can take: they can accelerate their innovation trajectory, or they can fully embrace being a commodity player. Innovation: The most exciting way of escaping the Commodity Trap is to innovate your way out. 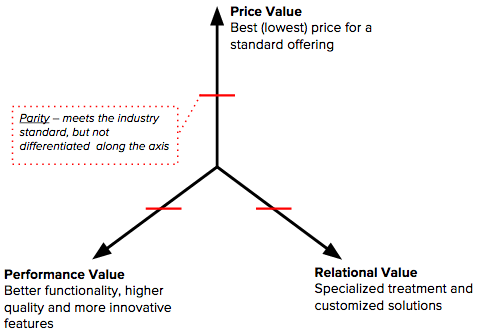 Consider the following model which demonstrates how customers perceive value for a given product. By standing out along any of the three axes, while maintaining a parity position along the other two, a product can start to differentiate itself from competitors and substitutes. Unfortunately for banks, two of these axes seem unlikely to yield fruit. There is little room for price-based competition given the interest rate environment and the high degree of price transparency. And due to the availability of third party services, it’s unlikely that any sort of lasting differentiation will be attainable through a performance based innovation agenda. This is particularly unfortunate given the large investments that bigger banks are making in innovation labs. However, there is potential to make progress along the relational axis. Most banks are aggressively cutting back on their distribution network and encouraging customers to utilize self-service options. 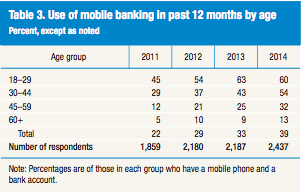 Other banks are pursuing alternative formats (mobile ATMs, cafes, etc.). There remains an opportunity for one of the larger players to develop a breakaway format that will deepen the relational value for customers. 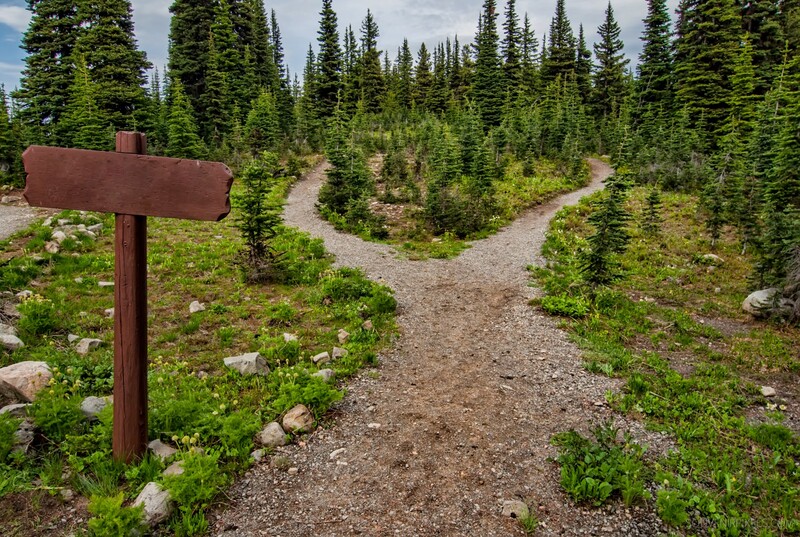 Embracing Commoditization: The second path is far less exciting, but is also less risky. Rather than focus on developing tools that serve to acquire customers, banks could retrench and focus on the parts of their business that are incredibly hard to reproduce: regulatory compliance and operations. By focusing exclusively on the backend, banks could achieve huge savings by reducing their marketing budget, and selling their distribution network. They could instead devote resources to making their operations flexible, reliable and responsive. Imagine a world where a third party owned the customer relationship, while Bank of America owned the deposit insurance, back end policies, and risk models. What would this world look like? Counterintuitively, this world likely has greater diversity of products and services because product experimentation would become far cheaper. The front end would be owned by new players both big (Apple, Google, et al.) and small (e.g. Simple) who would develop deeper relational value with customers. Meanwhile, backend providers would no longer need to worry about acquiring customers. Instead, they would focus on developing better customer management tools (reduced funds availability times, faster payments, etc.). Conclusion. The sooner banks realize they are caught in the commodity trap, the better off they are. If banks take a hard look at their assets, it will become clear where their core competencies are, and what their decision should be: banks that excel at developing products and building brands would be better off choosing the innovation route, while companies who excel at operations would be better off by embracing commoditization. Those who fail to choose a path are not long for this world.